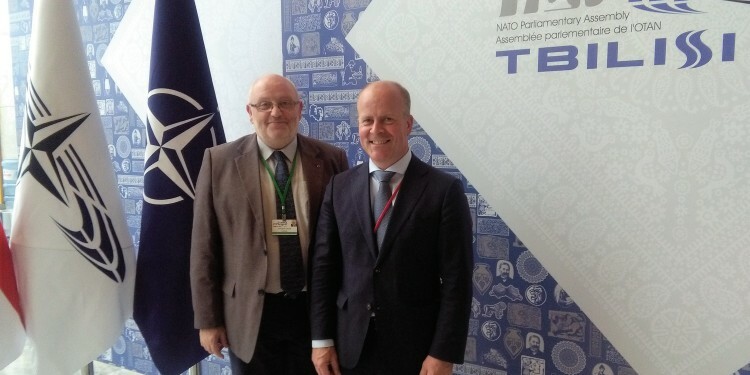 The 2016 spring session of the NATO Parliamentary Assembly (NATO PA) took place in Tbilisi, Georgia from 26 to 29 May 2017. The NATO PA brought together more than 300 parliamentarians from NATO member countries from North America and Europe as well as delegates from partner countries and observers to discuss reports, recommendations and declarations. EUROMIL was one of the few observers and monitored two of the NATO PA’s Committees. “We meet here in Tbilisi amidst a period of great global uncertainty. The Euro-Atlantic community’s eastern and southern flanks have been destabilised by Russia’s adventurism and the widespread turmoil across the Middle East. In addition, terrorism, cyber-attacks, disinformation, refugee flows, the rise of narrow‑minded nationalism as well as enduring instability in parts of the Western Balkans and Afghanistan challenge the security of our citizens while straining the cohesion of our societies and our international community” Chairman Alli emphasized. On his turn the Head of the Georgian Delegation, Mr. Irakli Sesishvili, said that Georgian politicians “realize that the democratic development of Georgia is not only a requirement towards Euro‑Atlantic integration; it is also our desire and more importantly, what Georgian society demands. Hosting the NATO PA Spring Session in Tbilisi is a good example of our country’s further democratic development.” “Unfortunately, our progress is not a pleasant development in the region for some, like the Russian Federation. Moscow has militarily violated Georgia’s territorial sovereignty and has illegally occupied the Georgian regions of Abkhazia and South Ossetia. Russian military aggression and its provocations in various forms towards its neighbours have become routine by the Kremlin” Mr. Sesishvili added. The Defence and Security Committee has been held on Saturday 27 May. As always, the Spring Session does not vote on reports, but the draft documents are presented and discussed in order to finalise them for the Autumn meeting. The Committee meeting was opened by the Dutch Chairperson Raymond Knops (left on picture above)who welcomed the delegates and asked for a minute of silence for the victims of the recent attacks in Manchester and Egypt. The first spot on the agenda was foreseen for the host country represented by the Minister of Defence of Georgia, Mr. Levan Izoria, and Major General Vladimir Chachibaia, Chief of the General Staff of the Georgian Armed Forces. Both speakers drew a clear picture of the current political and military situation on security and defence in Georgia. The minister focused in particular on the defence spending discussion which was also a topic during the NATO Heads of State and Government in Brussels just a few days before the Assembly’s meeting. Due to budget reasons, Georgia dismissed about 2.000 civilian and military (most of them senior officers) defence workers. It became however not clear in their speeches under which conditions they were dismissed. Minister Izoria said: “We have already increased the amount of the defense budget allocated to modernization from 2% to 6% and intend to incrementally reach 15% by 2020.” Asked for more details about this issue by several members, he answered that there is a firm political support to increase the defence budget from both, majority and opposition parties. There seems not only to be a strong political will, but also a large support by the society to invest in ‘their’ defence. “There is no social security, without physical security” minister Izoria added. Amongst the considerations of the draft reports, special attention has been drawn on the Special Report Afghanistan presented by the Special Rapporteur Wolfgang Hellmich from Germany. It became clear that NATO and the national governments, should not lose focus on Afghanistan. Funding and reforming the Afghan security sector are vital. The Afghan President Ghani developed a four-year roadmap to enhance the capabilities of the Afghan National Defence and Security Forces (ANDSF) with a key focus on the fight against corruption. It is vital to implement this plan to create the security environment necessary for the men and women of the ANDSF as well the Allied and partner nations’ armed forces. Last but not least, Angelien Eijsink from the Netherlands presented in name of the Rapporteur Attila Mesterhazy from Hungary a draft report NATO-EU Cooperation after the Warsaw summit. After several unfruitful initiatives to strengthen the NATO-EU cooperation, the signing of the Joint Declaration at the NATO Summit in Warsaw gave new momentum. Seven areas for renewed focus on cooperation have been identified, going from countering hybrid threats to exercises and operations to defence and security capacity building. As an interim conclusion, the draft report sees a need to encourage more cooperation between NATO and the EU. More than ever in history, this is needed to face the manifold internal and external security challenges. Even if many practical and political hurdles remain, the rapporteur emphasized that the EU is demonstrating the will to act on security more recently. The Political Committee under chairmanship of the Latvian Eriks Kalnins opened with a speech of Mikheil Janelidze, Minister of Foreign Affairs of Georgia. Minister Janelidze focused especially on the foreign and security priorities of Georgia with special attention for their partnership with NATO, EU and several individual states. On her turn, general rapporteur Rasa Jukneviciene from Lithuania presented a short but interesting report ‘Russia: from Partner to Competitor’. NATO-Russia relations are currently at their lowest since the end of the Cold War. Provocative actions towards NATO, aggressive actions against Ukraine, Georgia and other NATO partners undermine the stability of the Euro-Atlantic area. One of the points of discussion was the deployment of allied forces in the Baltic countries, Poland and Romania and the consideration whether this should be permanent or not. Other draft reports on ‘Challenges from the South’ and ‘NATO and Security in the Artic’ were presented by their rapporteurs Julio Miranda Calha from Portugal and US Congressman Gerald E. Connolly. All these draft reports will be back on the agenda of the autumn meeting in Bucharest for amendment and approval. The closing plenary session has been opened by the Assembly’s President, Mr. Paolo Alli and followed by several speeches by high ranking Georgian officials. Before closing the Spring Session, the Assembly adopted a Declaration presented by Rasa Jukneviciene (Lithuania), Vice-President of the Assembly. Being for the first time in Georgia for a NATO PA meeting, the draft declaration supported Georgia’s Euro-Atlantic integration. At first the Assembly congratulated Georgia to the 99th anniversary of the adoption of the Act of independence and with the 26th anniversary of restoration of independence. The Assembly is committed to deepen the cooperation with the Parliament of Georgia, elected in October 2016 after well-administrated elections. The Russian Federation was called upon to respect the independence, sovereignty and territorial integrity of Georgia. The Russian Federation should also withdraw its military forces from the occupied regions and facilitate the access of international human rights observers to the regions of Abkhazia and South Ossetia. Being for the first time on a visit in Georgia, the President of EUROMIL used the opportunity to have meetings with local representatives and institutions. As far as EUROMIL is informed, military personnel in Georgia has no freedom of association and the regulation on the freedom of expression is unclear. Also in the field of political rights it seems from the answers of Georgia to the Council of Europe, that Georgian soldiers only have the right to vote but not to stand for elections. EUROMIL discussed these and other issues with the Public Defender (Ombudsman) of Georgia and the Georgian Veteran Federation. At the end of both interesting talks it has been agreed to remain in contact and come back on short term with more concrete initiatives.